The lumberhorn is a 2 x 4 with an echo chamber on the bottom, and two piano strings tuned with wing nuts. The sensibility that would lead someone (lumberhorninst B.J. McCrow) to conceive of and build such an instrument instead of just using a bass pervades Blood Is Thicker Than Moonshine, and that’s a good thing. 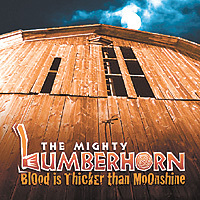 The Mighty Lumberhorn describe their sound as “hillbilly music,” but it’s hillbilly music for 2004, which means that they incorporate the occasional searing electric guitar solo into their bluegrass/country base and write songs about Tupac Shakur. It also means that they have weird, irreverent takes on such subjects as religion (“What Would Jesus Drive,” “I’m Gonna Burn In Hell,” “Hallelujah”) and romance (“Shotgun Wedding”). Songwriting duties are split between McCrow and banjo/guitar player Boy Howdy, with one song by mandolinist Buster P. Highman, the marijuana ode “Tale of Two Janes.” McCrow’s songs tend to be stranger, peaking with “Armageddon Over You,” which makes personality types out of Hershey’s miniatures, quotes Aerosmith, and mashes the Green Acres theme together with the main riff from Iron Man. Of course, “stranger” is a relative term–Boy Howdy being responsible for “I’ll Come Back and Haunt You When I Die,” among other songs. Still, it’s not all silly. There’s genuine bite to the humor, and there’s a traditionally-styled lonesome drunk country song, “Wish You Were Here”–although it sounds flat compared to the rest of the album’s weird fun. However, the odd but uplifting “Crow Can Fly” and the genuinely bile-filled “Northwest Indiana” prove that The Mighty Lumberhorn can be serious without losing energy and creativity. Blood Is Thicker Than Moonshine is available at Atomic Records, Lotus Land Records, Rush-Mor Records, Tip Top Atomic Shop, Jackpot, CDBaby.com, and at shows. For more information, see www.lumberhorn.com. The War on Garlic Mustard… Hopeless Endeavor or Effective Management?